1. By Beneficiary Login – When beneficiary has registered as well as new mobile number. 2. By CMO In - Charge – When beneficiary has not registered mobile number yet or does not have registered mobile number. Enter the beneficiary id of main card holder, date of birth and mobile no. that exists in the CGHS database and click on Register button. OTP is sent to the registered mobile no. 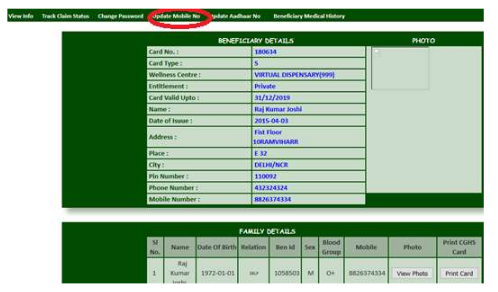 Step 3: The beneficiary can then enter beneficiary id and password on screen shown in step 1 to print plastic cards of family members or update mobile number, email, Aadhaar Number or view medicine history etc. Click on relevant option like ‘Update Mobile No’. Step 5: Enter the mobile numbers of the self/dependents and click on submit button. In case the mobile number of a beneficiary is not available in CGHS database or does not have already registered mobile number, in such cases the beneficiary has to approach the CMO In -Charge of respective wellness centre with his/her mobile. The CMO In-Charge will update the mobile against the beneficiary id. An OTP will be received on beneficiary’s mobile number that will be communicated to CMO In-Charge to finally update the mobile no. of the beneficiary.